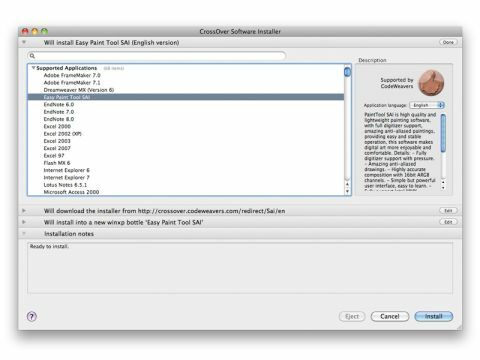 CrossOver has come in for a fair amount of stick over the years, and for good reason: it's basically a paid-for version of the free Wine – a popular Windows emulator with its roots in the Linux OS, albeit one with a clumsy interface pasted on top and a price tag which isn't reflected by the improvements it offers. In that respect nothing has really changed with this new version 10. Sadly, CrossOver still isn't suitable for modern gaming, struggling with almost everything we tested. A companion product, CrossOver Games, claims better frame rates, which is certainly true but only because Crossover gives such very awful results. To its credit, CrossOver does a decent job of running basic office apps, but anything even slightly system-intensive falls flat. There are just over 1,000 apps marked as 'Gold' in Codeweavers' medal-based ranking scheme for compatibility; those that aren't are almost assured to be the ones you want to use. Of course, the biggest flaw is still apparent: it's not impossible to find an old copy of Windows XP for the same price as a copy of CrossOver. While the logic of buying a Mac then installing Windows is flawed, the only advantage that Crossover offers is integration with OS X, which Wine does reasonably. We admire Codeweavers' philosophy, and its customer support is nothing short of brilliant, but CrossOver still can't quite justify its existence.